All Patriots Love this Castle! Description: Have an "out of this world" party by sending your patriotic kids on a rocket castle jumping jorney. 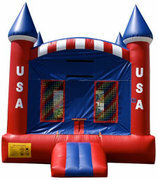 This Patriotic Castle Bouncer will let your kids have a blast at their party.